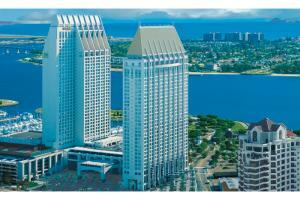 Experience the best of the city at Manchester Grand Hyatt San Diego. Boasting a spectacular waterfront location and lavish amenities, this unique urban resort offers a retreat the whole family will enjoy. Each guest room offers a partial view of the city or Bay, and features one king or two double Grand Beds. Located only 3 miles from the San Diego International Airport in downtown San Diego.